I Listed My Revenue Streams, Have You? About 10 days ago I had a few hours of quiet time with no kids, and a laptop with no internet connection. I was kind of trapped in a room, not able to leave. I decided to tackle a project I’ve been somewhat neglecting for a while – listing out my revenue streams for 2009. I have repeatedly blogged/talked about multiple streams of income, and have told people that I have 5 main revenue streams. So I decided to write them down, define them, project income from each stream for 2009, and then go out to 2010. It was a fascinating activity. 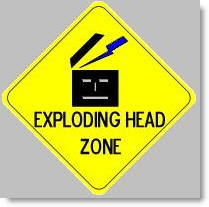 I felt like my head was going to explode (coincidentally, I googled “head explode” on images.google.com and found a bunch of… well, exploding heads… this image is the only one I could find that wasn’t offensive!). I’d like to share my revenue streams with you, although I won’t in this post. I don’t want to sway or influence you as you brainstorm your own revenue streams. I’m really excited to share some of my 2009 goals with you, which I plan on writing about this week. I do want you to define your revenue streams. What are they? How much are they worth? How are you going to accomplish your income security (and, income diversification)? For me a significant part of success will be helping others succeed, which I’m really excited about. So do me a favor and list your revenue streams for 2009. Whether it’s $5k/month or $1k/month or $100/month, write it down. One of my revenue streams is quite insignificant in 2009 but the largest one in 2010. Feel free to list some in the comments, or email me privately … I’d love to hear what you are thinking, and I know my other readers would love to know what you are doing to achieve income security. If you are interested in daily actionable nudges to move your career forward (like this post), consider the JibberJobber One Thing. You can visit the blog to see what you’re getting into, or subscribe at the Yahoo Group. I’m still trying to earn my first nickel from my blog. Any ideas? You are so awesome. I’m up for this challenge because I truly need it. More soon. On the ball as usual Jason. Don’t they say writing it down makes it more real? I think so. A conversation on Twitter with a friend up in Canada, helped me firm up my goals for revenue in 2009 with a little mantra. “Focus, Finish …Flourish”. The exploding head graphic was so right on the button since my list of “potential” streams is twice as long as my actual stream and I find it is hard to focus on the present sometimes – or to get the right mix of effort on ‘current stream” vs. “potential stream”. Do you have any suggestions? Thanks for always being thought provoking. Nice timing – I went through this exercise last week. My revenue streams in 2009 will include coaching, workshops, key note speeches, fees for facilitating classes at the local University of Phoenix campus, facilitating workshops at Lousiana State University’s Continuing Education department and running my own teleclasses. To add a shameless plug about one of my newest streams of income (Jason, feel free to edit this part out if you like), you can find out more about my upcoming Networking for the Shy and the Not-So-Shy teleclass at http://networkingfortheshy.eventbrite.com. @Marcia – it is definitely much more real now that it’s written down. I’m going to memorize them too…. exciting. Regarding the right mix, I don’t know the answer for you, but for me I am looking out at my visualization I did with my coach (Kent, the comment right after yours), with a major goal in 2011. It helps me focus on the long-term. @Kent – I should’ve known you would have done it already :p Awesome, thanks for sharing. And no need to edit – I’m sure anyone who signs up will get great value out of your teleseminar. Sounds great for freelancers and gifted speakers. But what could possibly be my other revenue streams if I am employed full-time, do not own a house I could rent out and nobody wants to pay me for speaking in front of them…? I got into this because I was forced into it…. and over the last three years I’ve been able to discover the other revenue streams. I kind of happened upon them. I don’t know what is right or best for YOU. I don’t know what your skills are. But I’m a huge advocate of doing *something* … like I mentioned, it could be something that simply produces $100 a month. Like babysitting, being paid to get groceries, walking dogs, washing cars in a neighborhood, teaching art or piano, etc. Thanks for replying, Jason. Will think about it, though I prefer to spend my spare time doing things I enjoy and spending time with the people I love. I do not think that it will do me any good personally to wash other people’s cars next to a full time job and an MBA programme. @Angelika – I understand about the car thing, and this isn’t for everyone. I also don’t think that everyone has the same urgency. I did, because I had no other income, and now I’ve sufficiently scared myself about income in general that I’m being more proactive about it. That’s just me… I do not hope to encourage neglecting family, etc. A quick story – my first job after graduation was at a “building maintenance” company. Janitors. I was the first IT manager they had hired. This company was about $150M, and headquartered in a small town. A lot of people looked at them, I think, in awe… how in the world could you make a company so big doing janitorial work? The founder started in school. He carried his bucket and supplies to his client’s houses, earning a meager income. It started small. It always starts small. Like ecolab, who’s founder started mixing chemicals in his tub. I’m not sure if they had a vision to get huge, or wanted to, nor am I saying that the goal is to get huge, but sometimes small things lead to something else, other opportunities, etc. Anyway, like I’ve mentioned, each person will choose a different path, and that’s okay – this is a personal decision. I am just throwing ideas out there. Thanks, Jason. I see your point: Better think about what you can do than complain about unemployment. Just my point of view.